A government appointed one-man committee that is investigating alleged corruption charges against the retail giant Walmart in India will submit its report by April, Parliament was informed on Wednesday. "The government has decided to appoint one-man committee regarding media reports concerning Walmart vide resolution dated 31.1.2013. The committee has been asked to submit its report within three from months from issuance of the resolution," Minister of State for Commerce and Industry S Jagathrakshakan said in a written reply to the Rajya Sabha. In January, the Union Cabinet had decided that the probe would be conducted by a retired judge of Supreme Court or Chief Justice of a High Court. to gain access to its market. 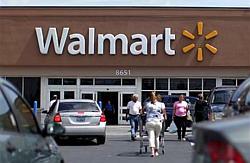 It was also mandated to inquire into recent media reports on disclosures of Walmart before the US Senate regarding their lobbying activities and details (and) whether Walmart undertook any activities in India in contravention of any Indian law. As per the lobbying disclosure reports filed by Walmart with the US Senate, the company has spent close to $25 million (about Rs 125 crore) since 2008 on its various lobbying activities, including on the issues related to enhanced market access for investment in India.